This post continues the series on openly sharing our approach to leading a virtual team – a joint project with Maren Deepwell (cross-posted here) for which we write a monthly blog post. This month we discuss checklists, how each of our staff invented their own scale to rate their week and treating others with kindness. Maren: I’ve been thinking about how to make time for both urgent and important things, and at the same time to reserve enough space for impromptu collaboration. This article on using G Suite to improve team performance via intermittent interaction for example argues that agile communication and collaboration is more effective than regularly scheduled interactions – but it’s much harder to do well in my experience. Following on from last month’s post in which we discussed trello and jamboard one of the things we have since implemented are some new checklists, for areas like payroll, GDPR and tech maintenance that cover regular, important tasks for the team, but aren’t related to urgent deadlines. I’m a big fan of checklists (and their history in aviation and healthcare in particular) and find them very effective in a team like ours and in particular for things that we don’t work on every day. We complete the checklist individually but we have a prompt at team meetings and then review the results together, which gives us space to raise questions. For me, another upside is that I spent less time on something that’s routine, if important, freeing me up for other things. As a recent development in our approach to leading the team, what are your thoughts on this? Martin: An aspect of checklists, particularly if they are shared, I hadn’t really considered until recently was how they can be used to ‘nudge’ team members. Nudge theory was something I first heard about many years ago talking to a contractor who worked with the UK Government, in part supporting the British Cabinet Office Behavioural Insights Team, also known as the “Nudge Unit”. It was only recently at the Scottish ELESIG that I first heard it being referencenced in a learning and teaching context. This also got me thinking about nudges in distributed teams. I’ve no experience in behavioural science and I should also say I can see the dangers of going down a ‘nudge management’ route, but I can also see the value in exploring some aspects of ‘nudges’. An interesting paper I came across was Nudge management: applying behavioural science to increase knowledge worker productivity (Ebert and Freibichler, 2017). This paper highlights a number of nudge tactics and it’s interesting to see that things like quarterly reporting of goals/milestones is something we already do. I can also see parallels with some of the examples reported and the G Suite article and models of collaboration you mentioned earlier. It is unlikely we will get a Google style micro kitchen and I always wonder if there is more we can do to create opportunities for the informal exploration of ideas. Back to checklists I see one advantage of using these is it becomes easier for us to see who has and hasn’t completed activities … nudge, nudge, wink, wink say no more. Maren: I don’t like the term nudge management much, but it’s a very useful idea and so is the article once I got past the terminology. One benefit of using approaches like this in a small team rather than in a huge corporation like Google is being able to take an agile, informal approach to reiterating checklists: for example when a colleague added something new to their own checklist this week, we identified this as a gap and added it to the template for everyone. Two minutes work resulted in an immediate improvement. Similarly, being able to see an overview of everyone completing a monthly GDPR checklist makes the process more transparent and shows that everyone is participating. It improves communication in a very time effective way. Being a small team we can sometimes take a more playful approach as this week’s team meeting demonstrated. We often incorporate a check-in into team meetings, where we quickly and informally share how we are doing and how busy we are. That started as rating your week out of 10 (10 = the busiest) and has gradually turned into everyone rating their week on their own scale, be that a colour or phrase or similar metaphor. With a small team, that works because it still fulfills the purpose of the exercise: taking a step back and checking in with yourself, sharing that with everyone without being competitive and giving us a better sense of how everyone is doing. How individuals choose to rate their week, what scale they apply, also tells you a lot: it reflects their personality or mood, how they integrate with the team, how much of a sense they have of how they’re doing… it helps to fill the gaps formal reporting or catch ups can’t. We have established such a strong foundation in the team meetings process that we can now have more freedom to ‘personalise’ parts of it, like the check-ins. The way I see it, the better the structures we as a team have are and the more we trust them, the more freedom we have. I’m really interested in the relationship between those structures and the agility they can bring. Does that make sense to you? Martin: Being able to express ourselves is a good thing, I’ve never considered if it was more or less important for distributed teams. I think it certainly helps when there is work pressure on and the degree of informality perhaps provides a foundation in creating a culture for the ‘informal exploration of ideas’. I can also see the benefit of moving to a more abstract and personal scale. I think one issue with a 1 to 10 scale is it can potentially become a little divisive, particularly within a virtual team context. For example, Bob says he’s a 9, Margaret thinks ‘how is Bob a 9! ?’, in part because in a distributed setting it’s hard to see how hard Bob is working. Equally John might feel like a 6, but at the same time feels guilty that Bob is a 9. With everyone using their personal scale it becomes less quantifiable and more of a personal reflection which is less open to judgement. Using scales hopefully also creates opportunities for the ‘humble brag’. I know this month you’ve shared a post on the ‘Virtual no Distant’ blog on sharing success. In this post it highlights, perhaps on questionable research, the increased importance of sharing when things go well. As someone who usually has to be reminded to share my achievements I can see the benefits of this approach. In particular, where I see this fitting in is you might be ‘code red’, but that because the thing you were working on has been a huge success, the downside being it’s created more work. How do you feel about the ‘humble brag’? Maren: Hmmmm. I’ve written posts like How to share credit and praise yourself… reflecting on the value of (deserved) recognition and Don’t think you are brilliant? Think again… – so I have given this quite a lot of thought. Alongside terms like ‘imposter’ or ‘lurking’ I have ambivalent feelings about ‘humble bragging’ (i.e. to make an ostensibly modest or self-deprecating statement with the actual intention of drawing attention to something of which one is proud). On the one hand, modesty and humility are good qualities to have. On the other hand, it’s essential to learn how to assess one’s professional achievements and articulate them. Too often, particularly in our cultural context, professionals are unable to do that effectively (and incidentally this is something I come up against frequently as a CMALT assessor). I find that sometimes ‘humble bragging’ is less a reflection of personal modesty and more to do with not really reflecting on progress, or not being able to understand one’s role within a team, one’s contribution and why it is important. Not being able to say ‘I did this…’ or ‘It’s my responsibility to…’ can make it much harder for others to understand what the other person’s role is and to respond accordingly. That’s why a few years ago we introduced 360 degree feedback for everyone as part of our annual appraisal process. It’s a regular opportunity to practice giving and receiving feedback, both good and bad. That said, any form of sharing the highs (and lows) of our work is important and welcome, ‘humble brag’ included! I’m generally very communicative at work and I’m confident enough to share both success and failure. I try to be honest about things that go wrong because I want to show that it does happen and how to deal with it. But I appreciate that this is much harder for some and at times maybe a ‘humble brag’ is the best strategy, maybe the only way to communicate. Our job, leading a team, is to listen and acknowledge that achievement no matter how loudly or quietly it may be voiced. For me, it’s also about treating others with kindness (which is also why I am mentioning our postal Secret Santa, sending a little kindness to each other each December). 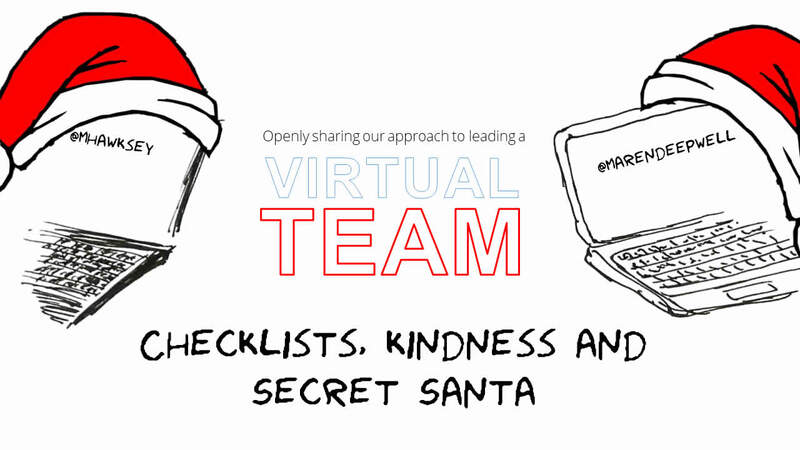 Martin: As tempting as it is to put ‘Secret Santa’ under the lens of ‘nudge management’ perhaps we should end here and show dear reader some of our own kindness and wish you all a wonderful holiday season and we look forward to sharing more of ALT’s journey in becoming a virtual team in 2019. Previous Post: What about GDPR?